"When I found out my 4-year-old daughter had Cancer, I was heart-broken, but the day she stopped crying and reacting to pain, I realized she was learning to live with it, and that was the worst feeling ever." Sivasakthi’s daughter Bavisri is only 4. The family hails from Athur, over 50 km from Salem, Tamil Nadu. The family led a simple, ordinary life till around 2 months back. It began with a common cold with multiple diagnoses. When little Bavisri got what looked like a common cold, it did not bother her parents too much, till she began to have trouble breathing. When they took her to the hospital, the doctor suspected a heart problem. After the tests they were referred to Narayana Hrudayalaya, Bangalore. 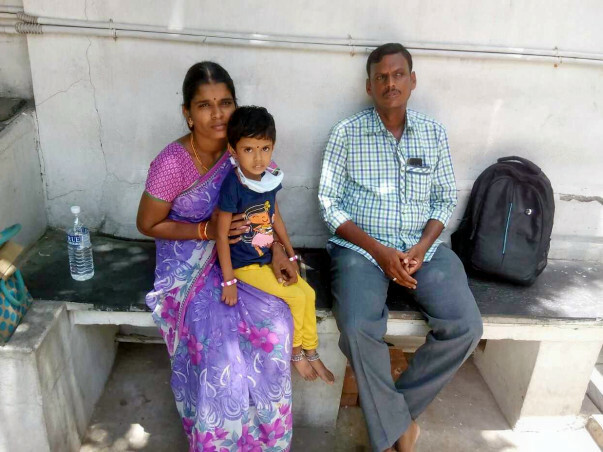 Still hopeful and keen to save his baby daughter, Siva borrowed money from some friends and left for Bangalore with his family. Here, when the doctor saw the reports, he prescribed a CT scan. After this, we were asked to go visit a different specialist in the hospital. “ I could have never guessed, but the moment I looked around me, my legs started to tremble. The seventh floor had a the Cancer ward. There were boards all over. I wanted to turn around and run right then,” Siva recalls the day. Little Bavisri was diagnosed with Cancer. Siva’s worst intuition came true. His 4-year-old daughter was diagnosed with Cancer. It was slowly eating her on the inside. The news totally shattered the parents. For the next 3-4 days they could not eat, speak or sleep. Their little daughter was fighting to stay alive, and they could do nothing to help her, or make it easier. She can still be saved with Chemotherapy. Siva knew that even if there was a cure it was beyond his ability to afford it. Siva works as a driver and earns around Rs. 8000 a month. Little Bavisri still has a good chance to be saved. The prescribed chemotherapy would cost the family over 12 Lakh. The father somehow started her treatment with some borrowed money. As the sessions started, he little one showed good response to the treatment. The helpless father wants to give his daughter a beautiful, painless life. However, with no money, he cannot even continue her treatment. He has quit his job to be with his daughter, and has already borrowed a lot and mortgaged all he had. An amount of 12 Lakh is too big for Siva to arrange all by himself. However, with a little help from many people, he can save his baby daughter. 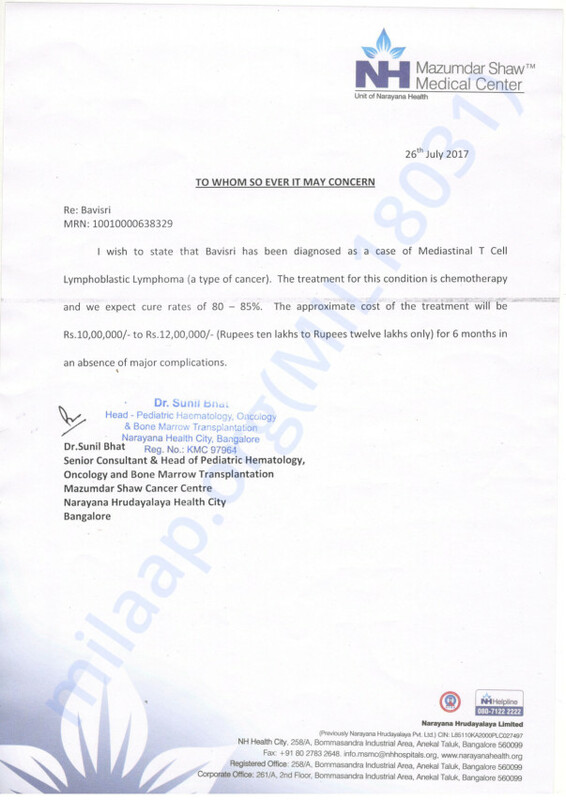 Any contribution made to this fundraiser will go towards little Bavisri’s treatment and help keep her alive. Thank you for your support. Bavisri's is doing well. She is still undergoing chemotherapy. Here is an update on Bavisri's health. She is continuing her maintenance chemotherapy and has shown signs of improvement. There are minor side effects which are taken care of by the medication. Thank you so much for your support and love. Here is an update on Bavisri. She is still on maintenance chemotherapy as mentioned earlier and is doing well. Please do pray for her health and hope she recovers soon.